The National Tramway Museum at Crich Tramway Village is delighted to announce that it has been granted funding towards the renovation and improvement of the display of tramcar exhibits in permanent galleries and exhibition spaces. 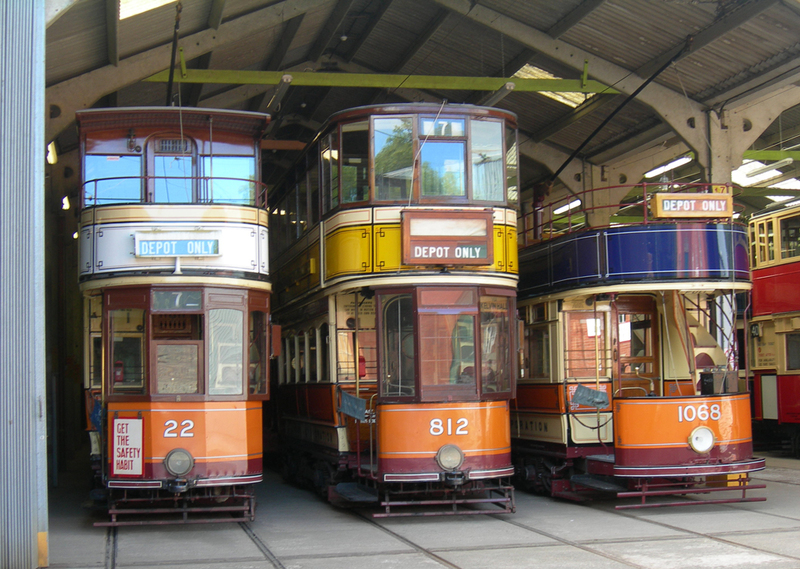 The Museum’s collections are one of the most comprehensive collections of tramcars and tramway history in the world and all the Museum’s collections are Designated as being of National importance. At the core of the collection is the Tramcar and associated works vehicle collection which comprises over 70 historic vehicles. There have been growing concerns for the ability of the main exhibition areas, which date back to the 1960’s, to protect the Nationally Designated collection long term and present it appropriately to the Museum’s visitors. Condensation and mould are two of the challenges that face us with the current buildings, and pose a threat to the long term care of the collection. A proposal for funding had been put forward for a new, fully insulated roof, insulated doors, partition walling and extra wall insulation. In addition, new interpretation panels and greatly improved lighting are required to enhance the visitor experience. The estimated total fund for the project is £400,000, but thanks to the DCMS/Wolfson Museums & Galleries Improvement Fund 2016-18, the project has taken a significant step forward as the National Tramway Museum has been offered funding of £100,000 towards the project for 2017 -18. “We want people to be able to enjoy world-leading culture wherever they live and whatever their background. These grants will make an important contribution toward increasing access to their wonderful collections and improving the visitor experience at museums right across the country. “This is a wonderful example of how a charity and government can work fruitfully together in partnership and we are grateful to government for matching our funding. The awards demonstrate the richness and variety of the country’s museum collections. From Egyptian mummies in Leicester to a Roman fort on Tyneside, this is a gloriously diverse set of projects – but all demonstrate excellence and all will improve the visitor experience. National Tramway Museum Curator, Laura Waters, and Richard Sykes, Tramway Museum Society Board Member and Tramcar Conservation Committee Chairman, compiled the funding bid. Laura Waters commented: “We are absolutely delighted that our funding bid has been successful, and that DCMS/Wolfson are supporting us to improve the long term care of the collection, and its presentation to our visitors. We’ve been working on how to improve the buildings for some time, and the funding will allow us to take a major step forward with this work. “Whilst the largest part of the funding will go towards the renovation of the roof, a proportion of the funding will also go towards improving the interpretation that we provide for our visitors. We will be redisplaying some of the smaller artefacts which are currently on display, but lack any interpretation for what they are and how they relate to the large tramcar exhibits, as well as incorporating some new items from our stores. There will be a ‘trams running today’ area, where visitors can read about the trams being demonstrated at the Museum, when they are visiting. The detrimental fluctuations in the environmental conditions will be significantly reduced by the improvements to the building insulation on the walls and roof, which will create a more uniform temperature within the building. This will have enhance the visitor experience in the building, as it will encourage visitors to spend longer exploring the exhibits and displays, in a more comfortable environment. Having listened to feedback regarding the current lighting, which has been described as poor at lower levels, and in conjunction with the continuing need to consider the needs and cater for visitors, with or without visual impairments, the project will provide both increased light levels overall within the building and in specific areas such as passageways and on wall displays, so visitors can feel more comfortable as they explore the exhibits and read the interpretation. Further funding is required to complete the work, and as a registered educational charity, Crich Tramway Village welcomes donations from the public.